In May 2012, we were the first to share full details about Graceful, a 82-metre superyacht under construction at Blohm+Voss. A rendering of the project is now revealed by the project manager Dörries Maritime Services. This impressive superyacht of 2,500GT started her life at Sevmash in Russia. The hull was shipped in late 2010 to Germany where she is being successfully completed by Blohm&Voss as confirmed by Werner Dörries, CEO of Dörries Maritime Services: 'The owner’s desire to work with the shipyard has turned out to be a winning solution and we are looking forward to another collaboration with the shipyard soon'. Graceful is designed by H2 Yacht Design and will accommodate up to 14 guests in a duplex master suite, two VIPs and three double cabins. 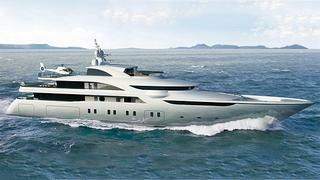 Special features include a 15m x 3m indoor pool with raising dance floor and a large helipad on the upper deck. Lloyd's registered and MCA compliant, Graceful is powered by twin 2,300kW MTU engines giving a top speed of 18 knots and a range of 6,000 nautical miles at 12 knots. Graceful is now scheduled to be launched in October.